Home / Scrollsaw Patterns / Seasonal Christmas Scrollsawing Woodworking Projects and Patterns / 3D Holiday Nativity in Wood Scrollsaw Woodworking Plan. 04-FS-158 - 3D Holiday Nativity in Wood Scrollsaw Woodworking Plan. 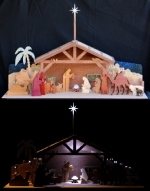 The nativity can be built from nearly all wood or can be cut from MDF. Use plywood or MDF for the structural part. The people and animals can be made from plywood or use hardwoods and paint or stain as you wish. All patterns are full size except for the base. Stock thickness can vary, depending on how you want to approach the building of the scene. An ideal scrap wood project. Lighting and wiring directions are provided, power LED lights with 3 AA batteries. Height without the mounted star is 10 inches. A few square feet each of 1/8, 3/8 and 1/2 thick plywood. If you plan to make the people from plywood you will need a couple square feet of 5/8 inch thick stock. Our wiseman dressed in traditional wardrobe, walking his camel loaded down with jars of spice and treasure. The camel is 72 inches wide and 69 inches tall, easily made from one sheet of plywood! 3 Kings on Camels Life Size Silhouettes Yard Art Woodworking Pattern. 3 Wisemen Life Size Silhouettes Yard Art Woodworking Pattern. Mary, mother of Jesus, is shown here sitting on the ground in prayer. You can use this yard art project all by itself, or feature it with the other Nativity Scene characters like the manger and baby Jesus.